All funds raised will go directly to CITY OF DUNEDIN PIPE BAND INC . Fielding 4 competition - all volunteer pipe bands gets pretty pricey. 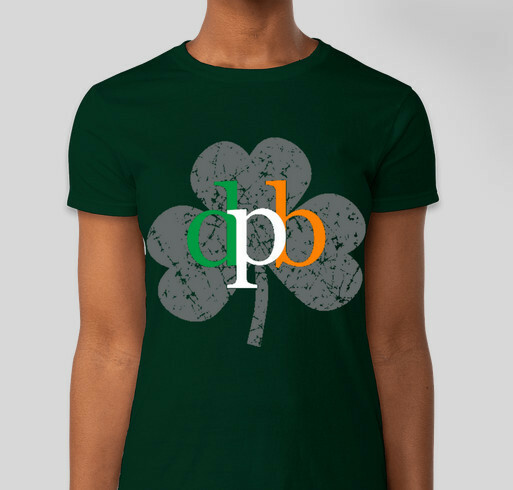 Deck yourself out for the upcoming St Pat's Day with this cool DPB logo shirt and help us in the meantime. DPB logo in the traditional colors of the Irish flag imposed on a lucky shamrock. We will be out and about playing, so purchase a shirt and join us in the shenanigans. All funds raised will go directly to getting bands to the out of town competitions. OUR VISION - The City of Dunedin Pipe Band will be the preeminent pipe band in the region and will be recognized internationally for our musical excellence. We will provide avenues for all members to participate, perform and encourage the promotion of all talented musicians to the premier competitive unit within the organization. We are the only Grade 1 in the whole of the USA! Sending some to our family up north. Share Why You Support "City of Dunedin Pipe Band St Patrick's Day T-Shirts"